Today, at Embedded Linux Conference Europe, the CIP Project announced the new CIP Core. The CIP Core project aims to provide minimal reference file system images and SDK’s to test and demonstrate the use of the CIP kernel and the CIP Core packages, a selected set of open source software components that require super long-term support. 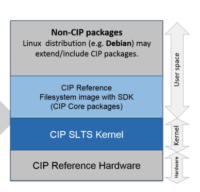 Within the open source base layer, the CIP Core connects the CIP Kernel with non-CIP packages (see figure 1). Users of CIP Core can easily extend or customize the reference file system by adding some of the packages already supported by Deby (non-CIP packages). For more about CIP Core, visit the wiki page, follow the quickstart or check out the source code. You can also register in the CIP’s public mailing list to learn more about CIP’s technical roadmap and participate in discussions. PRAGUE, CZECH REPUBLIC and SAN FRANCISCO – October 23, 2017 – The Civil Infrastructure Platform (CIP), which aims to provide a base layer of industrial grade open source software components, tools and methods to enable long-term management of critical systems, today announced the release of the CIP Core. The CIP Core, a ​reference ​minimal file system ​that offers a customizable environment that developers can use to test the CIP kernel and core packages, will be on display at Embedded Linux Conference Europe with planned workshops, demos and Q&A sessions. CIP aims to speed implementation of Linux-based civil infrastructure systems, build upon existing open source foundations and expertise, establish de facto standards by providing a base layer reference implementation, and contribute to and influence upstream projects regarding industrial needs. Hosted by The Linux Foundation, CIP addresses the needs of long-term software for the power generation and distribution, water, oil and gas, transportation and building automation industries. CIP members such as Codethink, Hitachi, Plat’Home, Renesas, Siemens and Toshiba are working to create a reliable and secure Linux-based embedded software platform that can be sustained more than 10 years and up to 60 years. Creating reference file system images to test and demonstrate use of the CIP kernel and core packages, a selected set of open source software components that require super long-term support. Achieving its first milestone after releasing reference file system images for the Beaglebone Black, the iWave RZ/G1M Qseven Development Kit, QEMU x86_64 and the DE0-Nano-SoC development kit. Consolidating the CIP kernel and core packages into a minimal reference file system that can be tested and used for further development. Leveraging released file system images that were generated with Deby, a reproducible and maintainable embedded Linux distribution currently based on poky and Debian LTS source code. CIP also recently launched Board AT Desk (B@D) v1.0, a customized and easy to deploy instance of the kernelci and LAVA projects that should allow developers to test Linux kernels on boards connected to their own development machines using the tooling provided by one of the most successful Open Source testing projects, kernelci.org. B@D v1.0 is provided as a vagrant virtual machine (VM) image/recipe and as a VM image, known as a Vagrant box. With this release, CIP is moving towards a “shared and trusted testing” target for not just those directly involved in maintaining the CIP kernel but any kernel developer that has physical access to a board. It reduces the deployment, configuration and maintenance costs. B@D introduces a “local” approach to kernelci.org which is a distributed service centrally managed. In addition, CIP intends to increase the number of developers and organizations willing to participate in kernelci.org by providing a simple mechanism to evaluate the technologies developed by that community (LAVA and kernelci) which CIP considers upstream. For more information about the B@D v1.0, read this blog post. Live demonstrations of the CIP kernel and LTS will be on display at the Embedded Linux Conference Europe taking place on October 23-25, 2017. The CIP booth (Booth M17) will be filled with innovative member solutions from Codethink, Plat’Home, Renesas, Siemens and Toshiba. CIP members Agustin Benito Bethencourt, Principal Consultant at FOSS and Codethink, and Ben Hutchings, developer at Codethink and CIP lead maintainer, will also share insight, tips and experience about maintaining a Linux kernel over a long period of time on Tuesday, October 24 at 4:55 p.m. This session will describe the kernel maintenance challenges CIP is facing, the plans to overcome them and what additional measures will be taken in the near future to walk towards maintaining the CIP kernel for 30 years or more. Additionally, Yoshitake Kobayashi and Urs Gleim, head of the Research Group of the Smart Embedded Systems at Siemens Corporate Technology and chair of the CIP governing board, will provide a CIP overview on Tuesday, October 24 from 11:45 a.m.– 12:25 p.m.. They will introduce attendees to the project’s strategy, use cases, technical roadmap, policies and milestones. CIP is also hosting open workshops and a developer meeting before and during the show for Linux developers and maintainers. On Sunday, October 22, CIP members will lead three workshops for testing, collaboration and Q&A sessions in the Athens room at the Hilton Prague. The workshop schedule is below. For more information or to register for a session, visit the CIP wiki. Additionally, CIP members will host a Q&A session on Tuesday, October 24 at 1 p.m. The meeting is open to any and all developers interested in CIP, LTS, Linux maintenance and Debian. For more information, visit the CIP wiki. The Civil Infrastructure Platform (CIP) is an open source project hosted by The Linux Foundation. The project is focused on establishing an open source base layer of industrial grade software to enable the use and implementation of reusable software building blocks that meet the safety, reliability and other requirements of industrial and civil infrastructure. For additional information, visit https://www.cip-project.org/. The Linux Foundation has registered trademarks and uses trademarks. For a list of trademarks of The Linux Foundation, please see its trademark usage page: https://www.linuxfoundation.org/trademark-usage/ Linux is a registered trademark of Linus Torvalds. In the consumer space, some devices never get updated, and you can consider yourself lucky if the manufacturer provides updates for several years, often just two as Linux LTS (Long Term Support) kernels had been supported that long so far. Google and the Linux Foundation realized that was not enough, so they recently announced 6-year LTS kernels at Linaro Connect SFO 2017, starting with Linux 4.4 released on January 2016, meaning it will keeping being maintained until January 2022 with security patchsets and bug fixes. But in the industrial/embedded space, they need even longer periods of support due to the longer equipment’s lifespan. I first heard about the Linux Foundation’s Civil Infrastructure Platform (CIP) project last year, when I covered the schedule for the Embedded Linux Conference Europe 2016. The project aims at providing a super long-term supported (STLS) open source “base layer” for industrial grade software. Read more at CNX Software – Embedded Systems News. The Civil Infrastructure Platform (CIP) project, hosted by The Linux Foundation, announces the publication of a new version of Board At Desk v1.0, a customized and easy to deploy instance of the kernelci and LAVA projects that should allow developers to test Linux kernels on boards connected to their own development machines using the tooling provided by one of the most successful Open Source testing projects. As a vagrant VM recipe. As a VM image, widely called a B@D box. Please visit the CIP Testing project Download page to download the latest Board At Desk (B@D v1.0) box. With this effort, the CIP project is moving towards a “shared and trusted testing” targeting not just those directly involved in maintaining the CIP kernel but any kernel developer that has physical access to a board. This reduces deployment, configuration and maintenance costs. B@D introduces a “local” approach to kernelci.org which is a distributed service centrally managed. In addition, CIP intends to increase the number of developers and organizations willing to participate in upstream kernel testing by providing a simple mechanism to evaluate the technologies developed by that community (LAVA and kernelci) which CIP considers upstream. LAVA has been updated to 2017.7 version. B@D now works on Windows 10 systems. B@D now works behind a webproxy. initramfs is now built locally, increasing reliability. The LAVA community releases a new LAVA version every month. CIP testing team have updated Board at Desk LAVA version to 2017.7, released this past July. It comes with many new features, enhancements and bug fixes that allow the CIP testing project to introduce more verbose reports, prevents issues related with partitions being filled with system logs, etc.. The previous version only supported Linux based systems as host OS. This new version of B@D also supports Windows 10 expanding the potential targets to those engineers who use this proprietary operating system in their development machines. Many organizations works behind a webproxy. B@D needed to give an answer to this use case, popular among CIP Members. Thanks to some contributions from Daniel Sangorrin, a Toshiba developer, Board at Desk now works behind a webproxy. Previously Board At Desk was using the initiramfs provided by Linaro in their infrastructure. This created in B@D a dependency on the network connection latency that, under certain circumstances led to errors due to timeouts. Now initramfs is built locally which improves the speed of the tests, removing that need to access to internet. In addition to the above, other features have been added and several bugs has been fixed, making Board at Desk more robust and reliable than before. Further information about this new Board At Desk (B@D v1.0) release can be found at the B@D Feature Page. If you are interested in testing kernels using Board at Desk, meet the developers at the cip-dev mailing list. If you find bugs in KernelCI or LAVAv2 themselves, please report them upstream. If you find them in the configuration or any of the previously described topics, please report them in the CIP-testing bug tracker. More general information about the CIP testing project can be found in the CIP wiki. Renesas has launched its RZ/G Linux Platform with the industrial-grade Civil Infrastructure Platform (CIP) Super Long-Term Support (SLTS) Linux kernel, which enables Linux-based embedded systems to be maintained for more than 10 years. The RZ/G platform provides a verified Linux package with cloud-maintenance and development options that makes it easy for embedded developers to leverage Linux for high-performance industrial equipment. Read more at Electronics Weekly. Renesas upgraded the Linux stack for its RZ/G SoCs to use CIP’s 10-year SLTS kernel. Meanwhile, the standard LTS kernel will expand from 2 to 6 years. The Linux Foundation launched the Civil Infrastructure Platform(CIP) project a year ago with the intention of developing base layer, open source industrial-grade software starting with a 10-year Super Long-Term Support (SLTS) kernel. The SLTS kernel is now ready to go, and is being incorporated by Renesas in its RZ/G Linux Platform stack for its ARM-based RZ/G system-on-chips. Read more at Linux Gizmos. Are you planning on going to the Embedded Linux Conference Europe? ELCE, located in Prague, Czech Republic from October 23-25, 2017, is the premier technical conference for companies and developers using Linux in embedded products. Traditionally, ELCE has had one the largest collection of sessions dedicated exclusively to embedded Linux and embedded Linux developers. This year is no different. Vendors and kernel and systems developers will collaborate with the maintainers and experts building the applications running on embedded Linux platforms. This year, developers will have the opportunity to learn about the Civil Infrastructure Platform (CIP) and how to get involved with industry leaders such as Codethink, Hitachi, Plat’Home, Renesas, Siemens and Toshiba. The Civil Infrastructure Platform (CIP) is creating a super long-term supported (SLTS) open source “base layer” for industrial grade software, components, tools and methods that will help key systems have a more sustainable workflow and less outdated software. The base-layer consists of an SLTS kernel, a basic set of open source software and standardization concepts that enable long-term management of technical systems such as electric power, transportation, water and waste management, healthcare and communication. CIP Members Yoshitake Kobayashi, Senior Manager of Open Source Technology Department at Toshiba, and Urs Gleim, head of the Research Group, Smart Embedded Systems at Siemens Corporate Technology, will provide an update CIP on Wednesday, October 25 from 9:50–10:10 a.m. in Congress Hall 1. They will introduce attendees to the project’s strategy, use cases, technical roadmap, policies and milestones. Participants will also get a look into technical details, development tools, testing and more for the CIP SLTS kernel. Add this to your ELCE schedule here. CIP also invites Linux developers and maintainers to open workshops in the Athens room at the Hilton Prague that takes place before the conference begins. On Sunday, October 22, CIP members will lead three workshops for testing, collaboration and Q&A sessions. The workshop schedule is below. For more information or to register for a session, visit the CIP wiki page. Additionally, CIP members will host a Developer’s Meeting on Tuesday, October 24 at 1 p.m. The meeting is open to any and all developers interested in CIP, LTS, Linux maintenance and Debian. For more information, visit the CIP wiki. Live demonstrations will be on display at the Embedded Linux Conference Europe taking place on October 23-25, 2017. The CIP booth (Booth M17) will be filled with innovative member solutions from Codethink, Plat’Home, Renesas, Siemens and Toshiba. Renesas will be showcasing the CIP kernel in action with real-time capabilities of the RZ/G1M SoC with an iWave iwg20m board. The demo will display the benefit of low and stable latency, and the value of RT-PREEMPT patch set. Siemens will link traditional industrial computing with Internet-of-Things (IoT) technologies based on IOT2000 devices, which are part of CIP’s long-term support commitment. The demo shows how to combine state-of-the-art sensor technology with proven, solid industrial approaches, and uses novel software mechanisms to describe automation processes. Codethink Ltd will showcase at the event Board At Desk v1.0, released a few days earlier, the CIP testing environment based on KernelCI, so any developer can test a kernel or a simple system locally in a board connected to her machine and share the results and logs. During the demo, the latest CIP kernel will be tested on the Beaglebone Black and Renesas RZ/G1M boards. Plat’Home will show the demonstration with IoT. It runs on original product, “OpenBlocks IoT VX1” with CIP kernel. OpenBlocks IoT VX1 is the compact server for IoT gateway. It uses Environment Sensor made by OMRON. It shows environment values at venue, such as temperature, humidity, atmospheric pressure, sound pressure, illuminance and ultraviolet radiation. If you’re attending ELC Europe, we look forward to seeing you there. If you’re not, stay tuned. We’ll add pictures and updates on the our blog post and @CIP_Project. © 2016 Civil Infrastructure Platform is a Linux Foundation Project. All Rights Reserved.